Mac Ryan has been a Cincinnati restaurant veteran with over 13 years experience. He has been crafting pizza since he started working at Zino's ( a former Cincinnati tradition) at the ripe old age of 15. Since then he has worked on incorporating more and more local ingredients into his pizza offerings. 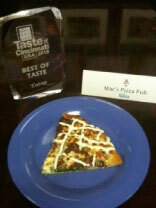 Mac's Pizza Pub won best entrée at the Taste of Cincinnati 2010 with the Chicago Gyro Pizza. While healthy is not what most people think of when talking about pizza, one of the most popular pizza places in Clifton and its owner Mac Ryan did exactly that. recipes and offered of minor changes to both and the addition of his "heart healthy" vegan cheese. Seven years and one national award later he could not have been more right. To this day the healthy pizzas are a major seller. So much so that Mac's has added another "white-sauce" vegan specialty pizza as well as offering gluten-free dough for any pizza.